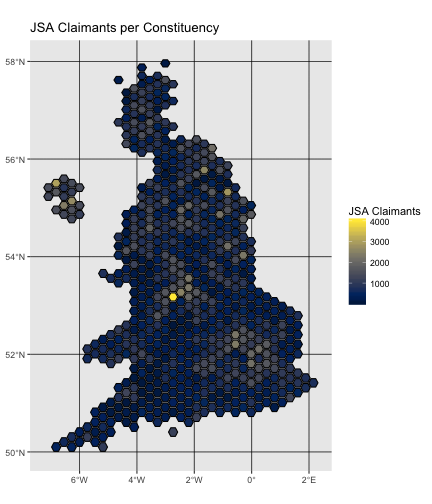 I’m excited to announce a new package for accessing official statistics from the UK. nomisr is the R client for the Nomis database. Nomis is run by Durham University on behalf of the UK’s Office for National Statistics (ONS), and contains over a thousand datasets, primarily on the UK labour market, census data, benefit spending and general economic activity. Registration is optional, although registration and the use of an API key allows for larger queries without the risk of being timed out or rate limited by the API. The nomisr package covers most of the features available on Nomis, with the exception of a grouping function that can easily be replicated in R using tools like dplyr and that will likely be incorporated into a future release, as will an optional parameter to change variable names to snake_case instead of the API’s default all caps response. Long term development is focused on making the package more user-friendly for people with less familiarity with Nomis data and the API structure. Thank you to reviewers Paul Egeler and Christophe Dervieux for their incredibly helpful comments and suggestions, and for Karthik Ram’s editorial supervision. nomisr is a much better package than would otherwise have been the case as a result of their efforts.